It can take years to build up the perfect closet. In the four years since customization was brought to Neopia, thousands and thousands of wearables have been released. As a result, die-hard customizers have been forced to find room for excess clothing in their SDBs, or else wade through hundreds of dresses and backgrounds whenever they change their Neopets' outfits. However, there are, of course, essentials that should always reside front and center in your closet. Whether you're new to customization, or you've been at it for years, these are twenty wearables you'll use every time you dress your pets. This looks perfect on any outdoor background! If there's too much empty space next to your pet, grab an (inexpensive) Stately Tree Foreground to complete the look. This foreground not only provides a nice tree to shade your pet, but light wriggles through the canopy of the tree and speckles the background for a beautiful effect. Pair with the Double Rainbow Background, or, if you're on a budget, the gorgeous Grassy Meadow Background. I love this thing! You can add it to almost any outfit for a masculine, or (depending on how you use it), sinister effect. I use this frequently because my Xweetok likes to dress up like a pirate, but it's wonderful with all manner of spooky backgrounds. I, personally, own a Hubrid Nox Collectors Cape (amazing layering piece, if you have Neocash to trade for it) and love the way the two look together, even if the outfit isn't Nox-themed. However, this can be used in all sorts of outfits. With a smarmy monocle and a nice top hat, your pet will look ready for a night on the town. The ultimate in femininity, these large pastel-colored tulips will look great on any outdoor background. This looks especially wonderful on pets with pinks, purples and blues in their fur. But it's just so... magical! :P This is the epitome of wand-ness, I assure you. Your pet doesn't even have to be wearing a magical-themed outfit to wear this! My pets sometimes just like to have a wand in their hands, and how cool would everyone think your pet is if they wore this to school? This looks especially cool if your pet is wearing something that shimmers, or something like the Stately Tree Foreground that dapples the outfit with light. One of my favorite backgrounds ever! Look at the lush green grass, and the immense mountains in the background-- with such a low price, anyone can buy it. This will definitely be the core of many of your outfits, especially in spring and summer. And maybe fall and winter, just because it's so pretty! Pair with the Flower Petal Foreground and your pet will look darling. The Burger King Promotion gives out beautiful backgrounds! This background is fabulous because it could be inside or outside since the garden has a wall around it. 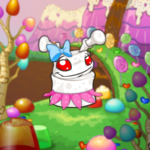 I'm sure we all have cutesy hair bows and girly dresses for our female Neopets, and this works with many of them. The colors are beautiful, especially with the soft hues of a baby or faerie Neopet's fur. Well worth the price tag! Get this if you're looking for something edgy. This blue wig will definitely make a fashion statement. The ribbon makes it cute without being over-the-top girly, and it really does look great on every single Neopet. Wigs are versatile pieces, so this (albeit unusual) wig looks adorable with any dress in your closet. I'm still waiting for the day that cosmetics from the Grooming Parlour become wearable, and until then, these are the closest we have to lipstick. It does look a little... off on some Neopets. But on species like the Draik, Cybunny and Poogle, it looks great. This can obviously work with many pieces, as it's an accessory, not the focus of the whole outfit. Another beautiful background! It features deep bluish-black colored trees surrounded by thick mist. This is great for Neopets, especially males, who are looking for less feminine clothing. This is such a pretty and versatile background! If you have a Caged Skeleton from the recent Krawk Island event, it definitely adds a spooky effect. You can really put together some great ensembles with this; it really is one of the prettiest Neopoint backgrounds out there. It amazes me how many of us allow our Neopets to go pant-less. Even I'm guilty of participating in this disturbing trend. Thankfully, TNT has noticed and has begun to release new varieties of trousers. I'd add those hardy blue trousers that were just released, but since the majority of us can't restock (myself included), this is the next best thing. Please, Neopia. I advise you and your Neopets: wear pants. Have you been enlightened yet? :P If you're looking to build a closet, almost all of my wearables are from site events, so make sure to participate when you can. And if you hold onto them until they inflate, they make nice investments that you can sell to buy shiny new backgrounds. Or you can greedily hoard all your precious wearables forever and ever. I would do the latter. Mallow Grundos – Do Not Eat! On behalf of all Mallow Grundos, I thought it would be a good idea to give Mallow owners some tips on how to care for such a special type of Neopet. Today, I'm going to explain to you the top 11 pets for survival situations. "The ground's hard," I moaned. "And it's freezing out here."